Rejoice snowbirds! Spring has sprung, so it is time to shake the snow off those boots and soak up the sunshine. In honor of these new beginnings, two of Las Vegas’ premier restaurants, Alize and Andre’s at the Monte Carlo, present new spring menus for foodies to enjoy. The products of famed chef Andre Rochat, each menu celebrates the season with spring influenced French dishes. Since the opening of his first bistro in 1973, Chef Andre Rochat‘s culinary history in Las Vegas spans 40 years of success, so these menus will not disappoint. Today, with the popularity of Andre’s at the Monte Carlo and Alize at the top of the Palms, Chef Andre Rochat and his protégés assert dominance in the Las Vegas dining scene. Since opening its doors in 1997, Andre’s at the Monte Carlo consistently wows Vegas vacationers and locals alike. Boasting a main dining room saturated with a French motif, Andre’s offers diners the royal treatment. Stunning chandeliers cast a romantic mood over the oversized half booths and delicately set white tablecloth lined tables. With décor as elegant as this, Chef Andre Rochat and his Chef de Cuisine Chris Bulen have created decadent a la carte and tasting menus to match. 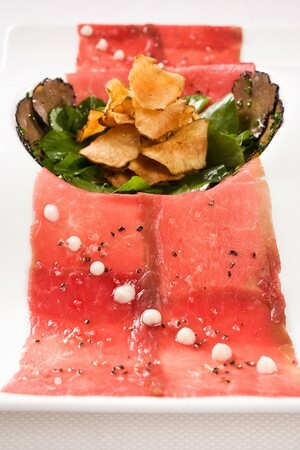 The a la carte menu features a collection of appetizers and entrees complete with filets, duck, and seafood selections. To start, first course items such as Seared Ahi Tuna and Heirloom Tomato Salad on top of burrata cheese announce that spring is in the air. For the main entrees, classics like Adjika Crusted Colorado Rack of Lamb served alongside chorizo and potato napoleon, confit shallot, purées of date and eggplant is a must-have. For a comprehensive Chef Rochat experience, try the seven-course tasting menu highlighting the best Andre’s has to offer. While Andre’s at the Monte Carlo emulates supreme regality, Alize takes diners to new heights-literally! Located on the 56th floor of the Palms Hotel and Casino, Alize’s reigns over the rest. Seated on red velvet chairs, guests bask in the glow of the twinkling lights of the Vegas Strip below while dining on expertly crafted dishes. This spring, Chef Andre Rochat and Chef de Cuisine Mark Purdy constructed a menu that reflects Alize’s sleek and sophisticated setting. Alongside a seven-course tasting menu, complete with Alize’s most popular items, the a la carte menu includes an expansive selection of appetizers, entrees, cheeses, and desserts. From starters like Andre’s Foie Gras Terrine to Warm Pear Beignets for dessert, diners at Alize can lavish themselves in award winning cuisine. The center of attention, however, is the Imported Dover Sole and Chilean Sea Bass, as well as prime filets, duck and chicken breast dishes. In true French fashion, the dessert variety encompasses favorites from Chocolate Truffles to Vanilla Crème Brûlée. Offering its own unique take on French cuisine, Andre’s at the Monte Carlo and Alize provide the perfect locales to escape the winter blues. Make a reservation today!